First there was the 200-year-old meditating mummy. Now, researchers have uncovered another case of mindfulness immortalized—this time in the form of a Buddha statue. 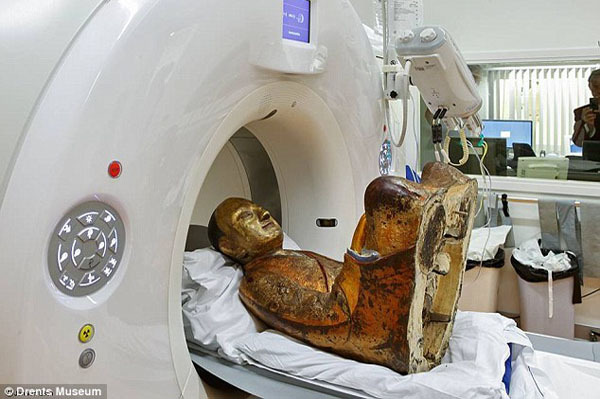 The statue, a traditional 11 or 12th century Chinese iteration of a peaceful Buddha with its palms face down on its lap and its legs folded into a cross-legged position, was on exhibit at the Netherlands’ Drents Museum last year and has long been known to encase mummified human remains. 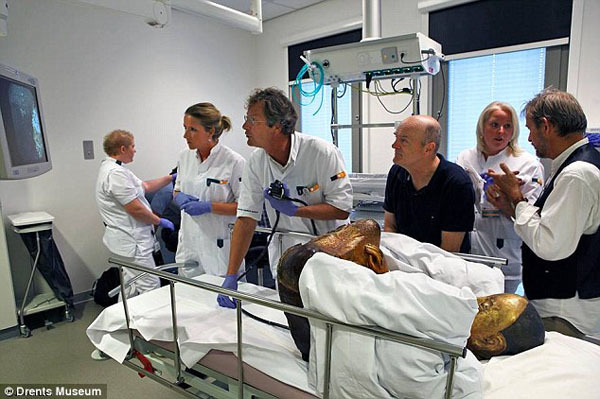 As part of a study led by Buddhist culture and art expert Erik Brujin, however, a CT scan and endoscopy of the relic at the Meander Medical Centre in Amersfoort has revealed the identity of the mummy to be Buddhist master Liuquan of Chinese Meditation School, who according to history passed away in 1100 A.D. Along with the successful study and identification of the mummy, Brujin and his team have found rolled up scraps of paper bearing ancient Chinese writings in the very spaces that had previously housed the monk’s internal organs. Buddhist practitioners and scholars note that meditators such as Liuquan and Mongolia’s Lama Dashi-Dorzho Itigilov, who appear to have undergone the religious mummification process of sokushinbutsu, are not really dead; rather, they are believed to be in an advanced state of being known as ‘tukdam,’ which is the closest one can get to becoming a genuine Living Buddha. Buddha or not, these souls’ staggering dedication to enlightenment literally stands the test of time.